Mash lentils with fork in a large bowl. Stir in peanut butter, salt, honey, oats, seeds, cinnamon, coconut and dates, if using, until well combined. Scoop out mixture using a tablespoon (or 1-inch scoop) and roll into balls. Refrigerate until firm, about 30 minutes. 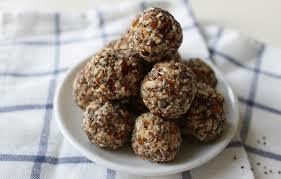 Option: freeze balls on a tray until frozen, then store in a sealed container or freezer bag. When ready to eat, allow balls to thaw for at least 10 minutes. Roll balls in coconut (instead of stirring in) before refrigerating. Press mixture into square pan. Refrigerate and cut into bars. Use any other nut or seed butter (including tahini) and any dried fruit or nut/seed as add-ins, OR omit all add-ins and simply stir together lentils, peanut butter, honey and oats to make quick power balls. Make PB & J balls: Scoop out mixture and press into flat disk. Add a small spoonful of jam or jelly into centre (not too much! ); fold up sides and roll into a ball so that filling is intact and not squeezing out.